First, let's get the important business out of the way. It was announced today that William Peterson is leaving CSI Crime Scene Investigation this season. No more Gil Grissom? Nooo! Noooooo! Favorite CSI line ever: When Gil sincerely asks an exterminator, "Does it ever bother you that you kill insects?" Loyal CSI viewers know why that was so funny. OK, on a slightly less important level, my anemia is getting better. Today, I felt almost energetic. I went to the ER last week and they ran a blood test, which showed my hemoglobin has risen from 8 to 11. Thrilling! I'm still anemic, but it's such a relief to see that this problem will be resolved in the near future. Of course, I have to get rid of the cause of the anemia, my psycho uterus. The hysterectomy is next month. One food that I've discovered is bison, or buffalo meat, which turns out to be a Super Food . It's much lower in saturated fat, calories, and cholesterol, but higher in protein, iron, and Vitamin B-12 than beef, pork, or chicken. It even beats salmon in every area, except Vitamin B-12. And bison are given no antibiotics, and spend few punishing days in feed lots. Of course, they do give their lives to us, so it's not perfect. I had to get my bison in Sacramento at Whole Foods. Apparently, bison is pretty popular with their customers. There was an abundance of chops, steaks and ground bison in the meat section. 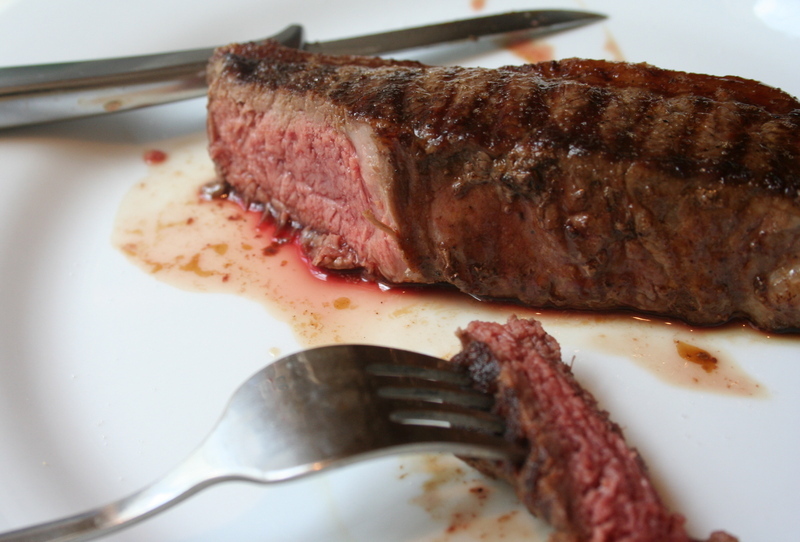 Bison is so nutritionally dense because the fat isn't marbleized in the meat. This meant that the New York Strip Steak was slightly less tender than beef. But, the flavor was rich and delicious. But, I prefer the ground bison. 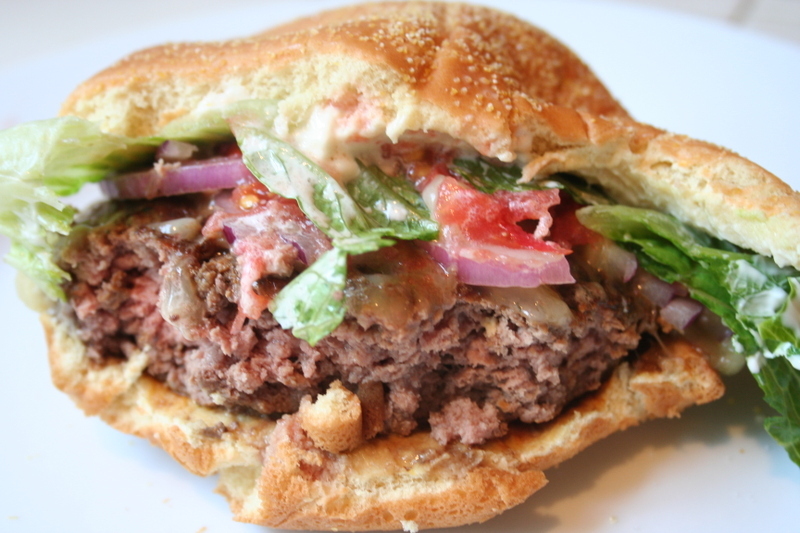 It's amazingly lean, but produces a very tender, juicy burger. I don't know how that happens, maybe someone else reading this can explain it to me. Bison has a slightly sweeter, richer taste than ground beef, which I enjoyed. And yes, it's more expensive than ground beef. I paid $6 a pound, but felt it was worth every penny. Here is my bison burger in mid-meal, starting to disintegrate, as is the habit of a fabulous burger. I've never eaten bison, but I'd love to taste that delicious looking meat! I'm pretty sure I'd love that meat! Your burger is drool-worthy! Sher, this burger looks awesome...and I love bison's rich flavour. So Catherine will get a promotion and replace him? Hmmmm... meanwhile I'm glad you're feeling a bit better -- keep eating those iron-rich foods! That bison burger looks very yummy and I am glad you have found a way to help with the anemia. Sorry to hear you will have to have surgery but you will feel much better afterwards and I am certain you will have kitty love to help you heal! Ahhh... I love bison (God bless their sacrifice). It makes me think of what cow USED to taste like. I didn't know they were a superfood. Bonus for me and the Frog then. I should tell my aunt. She suffers from anemia. So glad to hear your hemaglobin is improving. I've never tasted bison, no idea why not. This looks like a delicious burger though, love to taste it. I had my first taste of bison when I was in Vancouver last month and loved it. Raved to Barrett about it. Haven't been able to find it in the stores here yet, though. Someday! And of course, you can use ground bison to make meatballs! You know I love a good burger and every once in awhile I indulge with the ground bison. It is so flavorful and rich tasting. Somewhere I actually saw a bison bulgogi burger served korean style with kimchi! Take that anemia! Sher that looks so good. We have a local bison butcher very nearby but I have never tried it. What are your fav burger toppings/condiments? P.S. I'm anemic too. Good on ya for working so hard so fast to get better. Yum - looks great! I love bison and while I knew it was lean, I had no idea it had so much else going for it! oh my gawwwwd, i've been dying to try bison and that looks divine. and a part of my soul died today when i read that news about gil/william (we're on first-name basis). i'm the creep who finds it necessary to relate every moment of life to an episode of csi (well there's so damn many episodes you can relate it to just about anything!) unfortunately, i think i read this news on perezhilton so that negates any pity i deserve. WHAAAAT??!??! He's leaving??? Where did you hear that?! First Sara, then maybe Warrick, and now GRISSOM!?! Jesus. Now I need a new favourite show. Mmmmm that bison looks yummy. So sorry to hear you have to have the op - thats yucky and scary... How are you feeling? 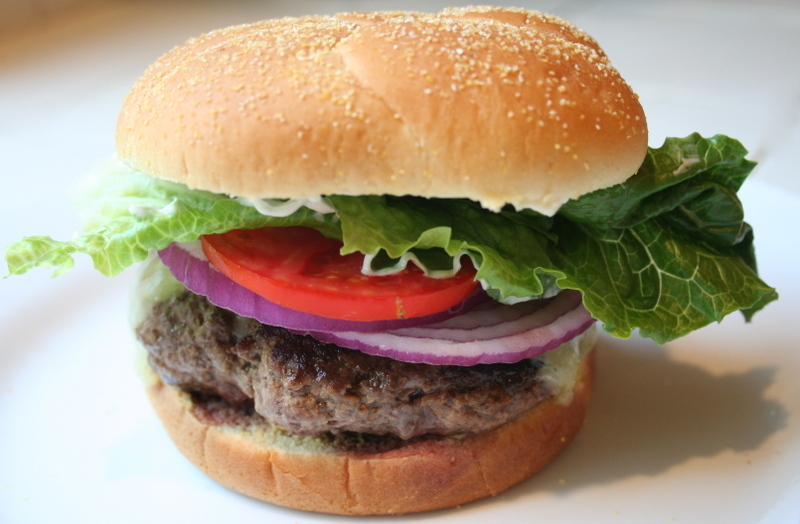 I just love bison, it makes the best burgers and has the nicest flavor! And I love it that its a superfood. I love bison meat. It just tastes so much better compared to beef. Those pictures look delicious. I am sure I would love to have one of the burgers. Never tasted bison meat though...I would like to binge on this one. Well, this Big Fat Bison Burger makes me feel hungry. Looks so delicious. Wish I can also go there and have a taste of it myself. Anyway, thanks for sharing this post. I enjoyed reading it. Just to think how many people think beef burgers are unhealthy! Not only is this burger recipe super delicious ( just looking at the pic is making my mouth water ) but it's healthy & nutritious too! Great for you! Is that really a bison? I haven't heard of a bison burger but this proves it. Thanks for posting! This all started as a search for Meta givens Cookbook for a pork ribs rescipe.